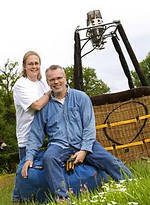 We organize hot-air balloon flights in a small sports balloon with a private basket for 2 passengers. 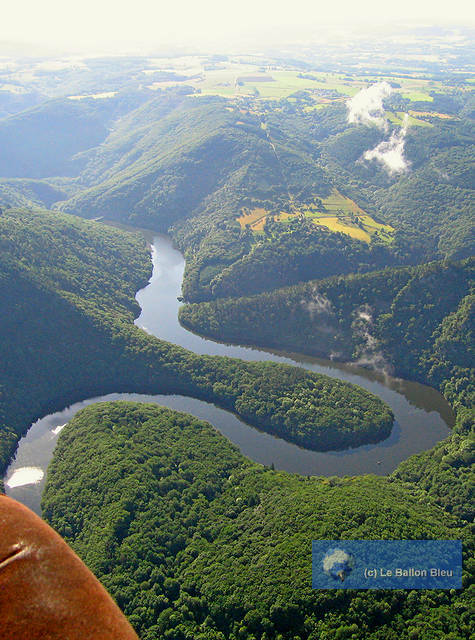 Discover the hilly plateau of the Combrailles with its hedgerows and ravines, in the department Puy-de-Dôme just outside the Parc des Volcans, and the gorge of the Sioule, one of the best kept secrets of the Auvergne and a Natura 2000 protected area. After the flight you celebrate the after-flight party and the hilarious baptism ceremony at our home. 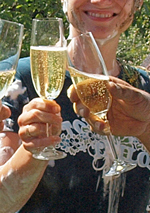 With drinks. 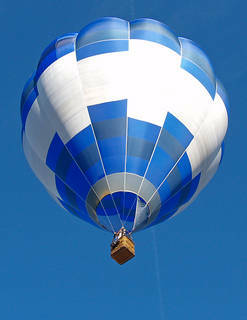 More about our flights, prices etc.. 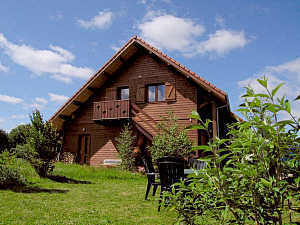 Le Ballon Bleu is also a three-star holiday cottage, in fact a studio apartment for two people who are looking for a calm holiday in a green area. 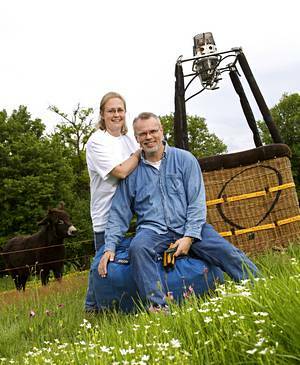 The studio can be rented by the week, separate or along with a balloon flight. A superb combination for an active holiday full of adventure. 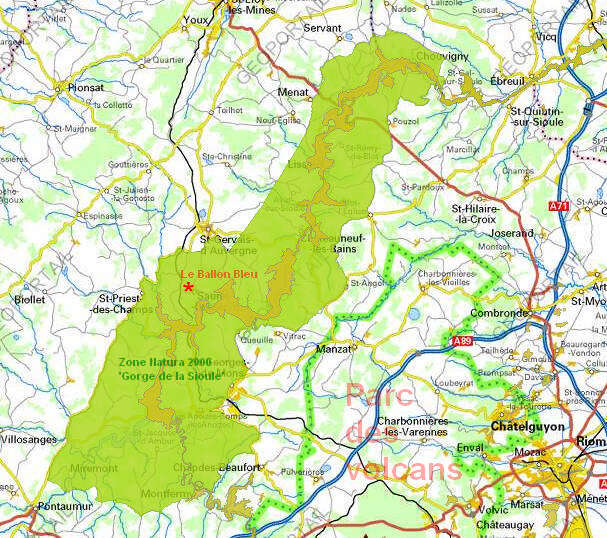 Our 'flight area' is situated in the Combrailles, a distinct area of plateaus, ravines and hedgerows some 30 kms North-West of Clermont-Ferrand. Our main launch site is in Sauret-Besserve, only a few hundred metres from the Sioule river valley and in the middle of the Natura 2000-area of more than 260 square kms meant to protect important bird habitats, mainly of large predatory birds like kites and eagles. 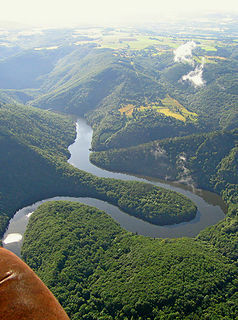 The Sioule river has cut an impressively deep and meandering gorge in the granit rock, rivalling the volcanoes in the opposite sense with its depth of 300 to 400 metres. Watch how the morning fog evaporates from the gorge, note how the winds differ around hills and in small valleys, experience the true adventure of a balloon flight! The distance of our base relative to some better known places: Clermont-Ferrand 50 km, Montluçon (Allier) 52 km, Vichy (Allier) 80 km, Riom 45 km, Vulcania 35 km, Auzances (Creuse) 32 km, Mont-Dore 70 km, Guéret 95 km, Paris 400 km, Bordeaux 377 km, Montpellier 390 km... 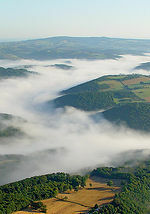 The summit of the puy de Dôme is at 28 kms as the crow flies.